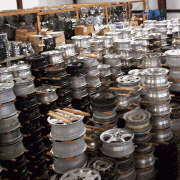 Hubcap & Wheel began in a small store front in1994 under the name of Hubcap Masters. It became apparent within weeks that wheels were also going to be a big part of our offering. Though factory wheel covers remain a strong item in our line up today, storage space for factory original wheels quickly outgrew our warehouse and storage facilities. This growth was also responsible for the change to the more descriptive name that we are known by today. 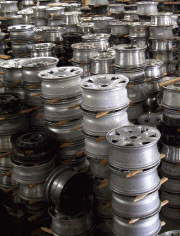 Expanding beyond supplying local automotive service, body repair, and dealership needs with good used factory original wheels and wheel covers, Hubcap & Wheel began offering refurbished factory alloy wheels to the public. We still sell the consistent quality today required to meet the stringent demands of the auto insurance industry. Individual and commercial customer requests for bent wheel repairs, prompted the need to develop custom equipment to straighten wheels in-house. So in 1998, after nearly a year in the development of the equipment and technique, Hubcap & Wheel began basic repair of pothole bends on alloy wheels. Over the next several years we gained a wealth of expertise and our ability to produce consistent quality was perfected. Thus the repair turn-around was shortened to same-day service to our local customers on most repairs. Early in 2003 we expanded again moving to our current location at 209 Richard Ivey Parkway in Macon Georgia, and high strength TIG welding (Tungsten Inert Gas) was added to our services list. As our ability at that time being limited only to wheels smaller than 20” we had to make an upgrade to the equipment. Larger repairs had to be turned away as the ‘fashion’ of wheels exceeded the equipment's size capacity. Since the number of wheel straightening facilities nationally is not that great, the market for machinery with which to equip them is limited. A search finally turned up equipment that not only met the needs for precision but also allowed the increase in size of wheels we can straighten to 26 inches. The equipment was ordered and built. Six months after receipt of the new equipment, all special modifications, hydraulic changes, custom die work, ancillary tools, and technique development were designed, completed, refined, and are still in use today and for the most part, unchanged since being placed in service in 2006. .The development of new processes and honing of skills has steadily increased the quality that local customers have grown to expect, and has now advanced to the point that a superb and safe repair can be expected to give reliable service for the life of the wheel. It is one thing to repair an item that is used locally, it is quite another to produce consistent and safe results for a customer that is hundreds or even thousands of miles away. We pledge that the quality control standards of our wheel repair division will insure a strong repair that meets factory specifications at the time it is returned to the customer to be put into service. As most individuals rarely need their wheels repaired, we strive to make your experience with us as pleasant as possible so that you will recommend us to others whom you may notice that require our services and be confident that you would be thanked for the advice.